Including the kids with the cookies can help sneak in so many math lessons, they won’t even realize they’re getting educated in the yummy process. Photo: Dave Vollmer. This has been a banner year for baking Christmas cookies in my household. In addition to shipping several dozen to the troops overseas, I’ve also given some to our base holiday cookie drive, which are given to the single Airmen who are staying in town for the holidays. We also like to give little tins of cookies to the kids’ teachers and bus drivers. Recently I’ve acquired a couple of elves to help me out. My sons, ages 7 and 10, are old enough to do just about everything in the cookie baking process (with plenty of adult supervision). My youngest son loves cracking eggs, which is just the beginning of the educational value of this annual tradition. I offer to you five small math lessons that can pay dividends for any young person to have a fruitful future in cooking and baking. 1. Doubling or Halving Recipes: This can be as simple as “Two eggs instead of one,” but it can also get a bit more complex, such as doubling 2/3 cup of flour. For a 7-year-old, multiplying “2/3” by two can be a new experience. 3. Oven Temperatures: Take time to show the kids how an oven works (a “conventional oven” works with convective heat transfer, not to be confused with a “convection oven” which works the same way, except with fans to help better distribute the heat). Baking temperatures that recipes suggest often relate to the amount of sugar, and how you want that sugar to react to the heat — in-tact or melted. Learn more about the melting point of sugar (along with some great tips on calibrating your oven) by reading this excerpt from Jeff Potter’s Cooking for Geeks , an essential part of my family’s cooking library. 4. Rolling Out x-inch Thickness or x-inch Balls of Dough: Again, teaching the kids measurement: break out rulers to show the kids how think 1/2″ or 1/4″ of rolled-out dough looks. 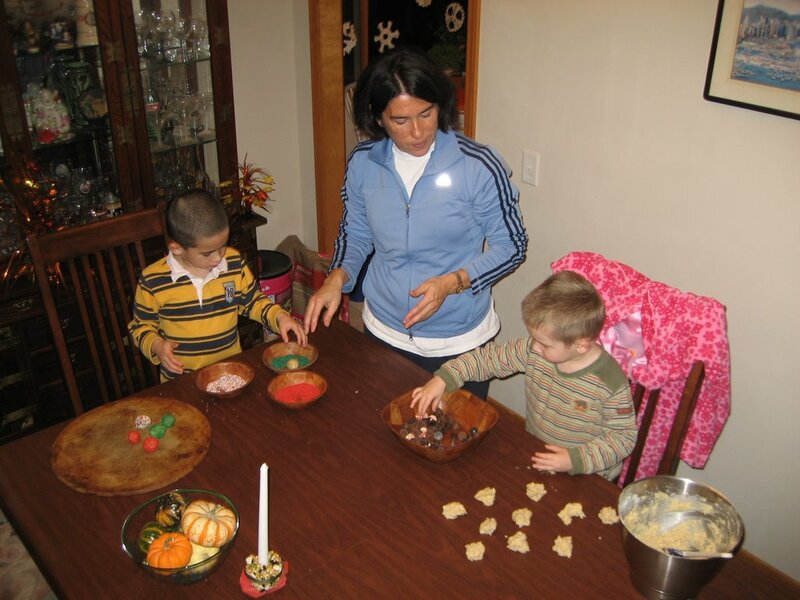 Make an example of a 1″ rolled out ball of dough and challenge the kids to replicate them. One of our family’s favorite cookie recipes, “Holiday Surprise Cookies“, does precisely this, requires the balls of dough to be rolled out uniformly. In fact, just yesterday, the kids learned the hard way the consequence of rolling out non-uniform balls of dough: about 1/4 of cookies, the too-small ones, were burned; about 1/4 of them, the oversized ones, were undercooked. 5. Dividing Cookies Amongst All Your Favorite Friends and Loved Ones: For younger preschool-aged kids, this is great: “Place ten cookies in this tin, please.” For older kids, ask them to divide cookies into dozens and watch the gears turn! Above all, don’t be afraid to turn your kids loose in the kitchen! Really, it’s okay… there will be messes, there will be mistakes, there will be lots of “factory seconds” as we call them in our house. The kids will have a blast and you can smile proudly: you taught your kids about math! And it was delicious. ← A Life Size Lego Hobbit Environment!